On March 15, afternoon, Bashir Ahmad Ganaie was returning from the Friday prayers when he heard about something untoward. Frantically stepping inside his room, he turned on his TV. And what came on the screen left the whole family down in the dumps. There was a mass shooting in al-Noor mosque of New Zealand’s Christchurch city. In this mosque, Ganaies’ had offered prayers, five times a day for around 10 years. The family now lives at Balclutha, almost 5- hours drive from Christchurch. As if the news wasn’t disturbing enough, the shooter, identified as Australian citizen Brenton Harrison Tarrant, 28, had live-streamed the whole episode on Facebook for the first 17 minutes. The shooting was a massacre of 42 people and many more were injured. One of the worshippers at al-Noor mosque whose pictures – with clothes soaked in blood – were flashing on the TV screen, Bashir used to pray with him shoulder to shoulder in the mosque. Faizal, Bashir’s son, quickly dialled the number of his friend Abdul, who he feared still lived in the city; he didn’t, rather he had moved to some other place. Hearing the other’s voice was a respite for a moment, but it didn’t last long, as, from him, Faizal learned that Moucad, a 3-year-old was among the slain. Moucad was the little brother of the duo’s other friend Abdi. Abdi and Moucad were born to a Somalian family who had fled fighting in their home country more than 20 years ago. It soon became obvious that the attack was linked to an increase in white-supremacism and alt-right extremism. Authorities had recovered from the shooter an 87-page manifesto filled with anti-immigrant, anti-Muslim ideas later. New Zealand is home to around 4.79 million people of whom Muslims make 1.1%. The net migrants in the year 2019 were around 15 thousand. Most victims of the recent mass shooting were among these Muslim migrants or refugees from countries such as Pakistan, India, Malaysia, Indonesia, Turkey, Somalia, Afghanistan and Bangladesh. 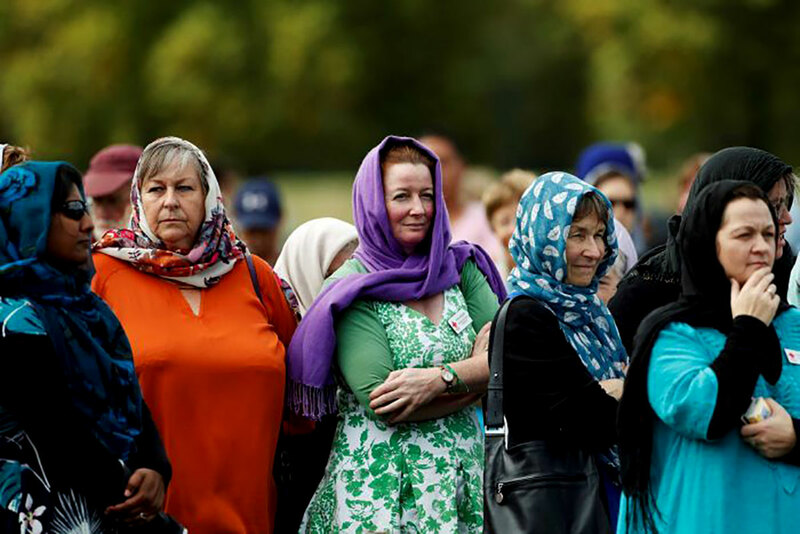 Women wearing headscarves in solidarity with NZ’s Muslim community. His parents’ worries were not misplaced. A second similar attack began at about 1:55 pm at the Linwood Islamic Centre, a mosque 5-km east of al-Noor, where seven more people were killed. Later, another suspect was arrested on Brougham Street in Sydenham, 21 minutes after the first emergency call. Reportedly, the suspect was planning to continue the attacks at a third location, possibly the mosque in Ashburton or the An-Nur Child Care Centre in Hornby. For the whole night ahead, the Ganaies waited in distress. It was on Sunday morning they finally decided to drive to Christchurch. There, the first thing Bashir did was to search for his friends he had lived with for the past decade. “We have many Asian friends there, mostly from Afghanistan,” said Faizal. But they couldn’t trace anyone of them. Since the bodies were yet to be identified, “our minds were rife with negative thoughts – the slain might be any one of our friends.” Amidst the chaos around, it was learned some of the people were busy with the injured at the hospital. Lodging his parents in a nearby hotel for the night, Faizal went to one of his friend’s home for the night stay. Ganaies are actually from Nodoo village in Pulwama. Before moving to New Zealand in 2006, Bashir worked in the Cooperative Department in Kashmir. “My parents moved here in hopes of a better future in terms of safety and money, like any other family moving overseas,” said Anjum, Bashir’s daughter, who was seven years old at the time of their migration, a year older than Faizal. From the inception till 2018, the Ganaies lived in Christchurch. Better job prospects took the family to Balclutha, last year. Bashir is currently a lab manager at Danone Nutricia; Jawhar, his wife is a homemaker; Anjum is a clerk at a local law firm, and Faizal, a Duty Manager at New World, a supermarket there. Later, that day, after dropping his parents back at home, Faizal wanted to return back immediately, but his parents refused again. “I told them that I need to go back. To offer support to my friend and others; to take part in the funeral of the martyrs.” His family permitted him on one condition – to rest for a night at least. 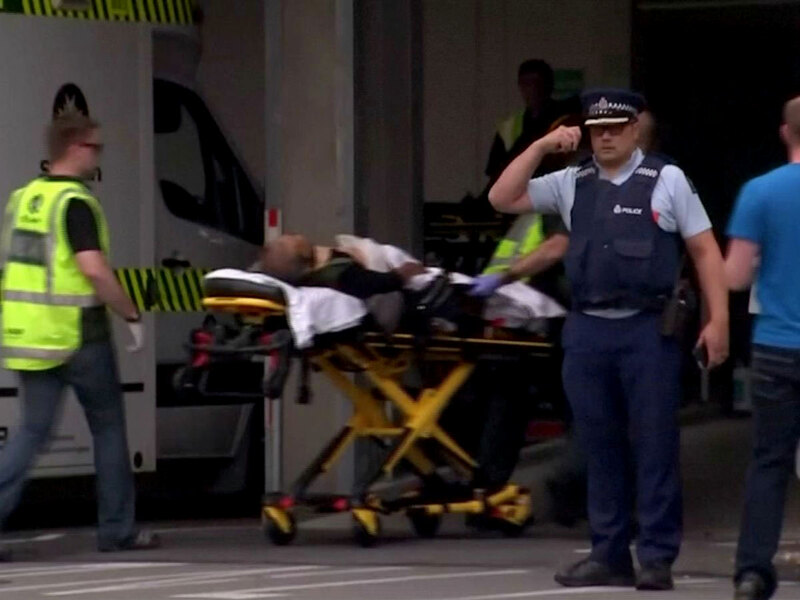 File photo of the injured in Christchurch Mosque attack. After the identification and necessary formalities, the body-handover to the families took a while. The first funeral prayers were conducted for Syrian father-son duo. The process took around two and a half hour. “There were thousands of people present, and everyone was given a chance to throw a handful of soil onto their graves.” That day, four more people were laid to rest. On Wednesday, Moucad, along with a couple of others was also laid to rest amidst tears. As days passed and all the bodies were released from the Christchurch Hospital morgue, Gamal Fouda, the Imam of a local mosque suggested a mass burial on Friday. Simultaneously burying all the bodies was said: “would garner the international attention of whatever our community was befallen with for no fault of ours”. So, Friday saw 26 more people interred in the graveyard. In front of the al-Noor mosque, streams of people gathered in the park opposite the mosque on Sunday. Many laid flowers and left notes expressing condolences or urging the Muslim community to “stay strong”. “The notes, which read: New Zealand mourns with you; we are one, etc was a bit of relief from the fear that was permeating the air,” said Faizal. Ms Jacinda Ardern, New Zealand’s Prime Minister, swiftly denounced the shooting as terrorism and announced a ban on military-style semi-automatic and assault rifles. Even people paid their respects around the country, with some forming human chains in front of mosques. Others said silent prayers at schools, cafes and even offices. The Muslim call to prayer sounded out over Christ-church and around New Zealand. The same thing happened to her mother at a grocery shop. Jawhar had a couple of people come up and hug her and apologise for the attack. A positive response pouring in from all over, although is a thing to consider, Anjum has still some reservations. “I think it is too early to tell whether anything has changed significantly as it has only been a while that people have been very nice,” she said. For this response of hers, she has reasons. 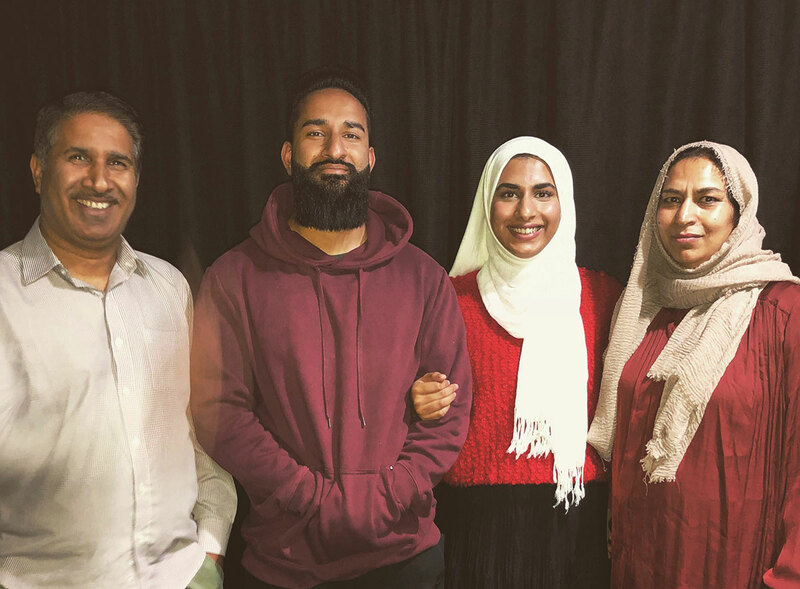 The time when the Ganaies moved to New Zealand, first Anjum and Faizal were too young to realise that their religion made them different, but they soon were able to comprehend it. 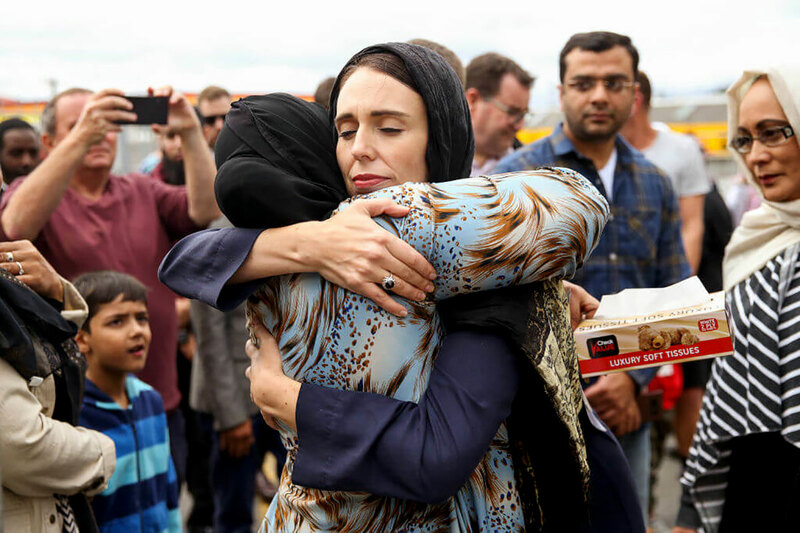 Prime Minister Jacinda Ardern hugs a mosque-goer at the Kilbirnie Mosque on March 17, 2019, in Wellington, New Zealand. Because of her Hijab, she also found it extremely difficult to get a job, “not even a part-time job in the supermarket”. So, after she finished her law degree, her family persuaded her to take her Hijab off as it would inhibit her prospects of getting a lawyer’s job. They were correct. So, when she sat in the interview for the law clerk’s job, she didn’t wear her Hijab. Now, after the terrorist attack, she has put her Hijab back on “because it is an essential part of me and I refuse to take it off even if I have to sacrifice my career or my safety for it”.